The Lammergeier -- a name which originates from German and means "lamb-vulture" or "lamb-hawk" may suggest that this vulture eats lambs, but, in fact, this vulture is quite harmless and incapable of killing lambs. 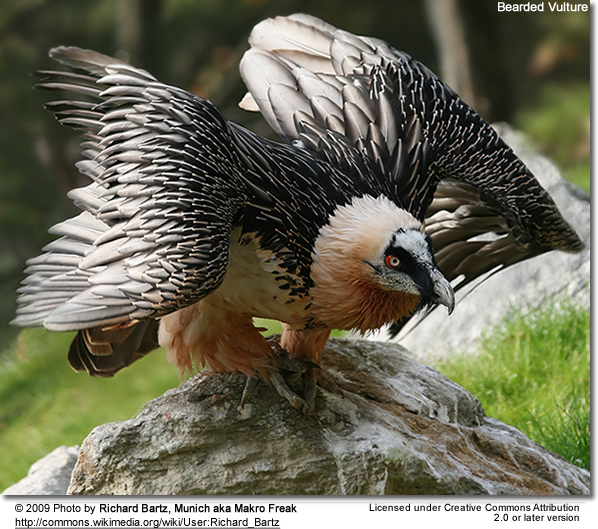 Because of this, this misleading name is being phased out and nowadays, this vulture is more commonly referred to as "Bearded Vulture". Its orange breast is caused by iron oxides gained from sand-bathing and wall-rubbing. It has been observed that the first born nestling may eat its younger sibling.